When you file for bankruptcy in Arizona, a number of factors will be considered when determining whether you are eligible. First, it will depend a great deal whether you are filing for Chapter 7 or Chapter 13 bankruptcy since the eligibility criteria for each is very different. Chapter 7 bankruptcy allows you to discharge all unsecured debts, like credit card debt and medical debt, and it requires that you meet certain income and other guidelines. Chapter 13 bankruptcy is like a debt restructuring plan, and it as different criteria. Some of the things the courts will look at when determining if you can file for bankruptcy is how much you make compared to the average in Arizona, what kind of assets you have, and what kind of debts you have. Some people have money in their bank account when they file for bankruptcy, even if they are struggling financially, and they are worried about losing that money if they file. They don’t want to lose the few financial assets they have to pay their other bills. The day that you file for bankruptcy, you cannot have more than $300 in your bank account. If you are married, you can have $300 in two accounts or $600 in one joint account. If you have more than that in your accounts, you can still file for bankruptcy, but the trustee will almost certainly ask that the extra money be used to pay your creditors. Your bankruptcy lawyer will counsel you on the right time to file based on when checks will be cashed from your account and when you expect deposits to go into your account. For example, it may be better for you to file just before you are paid at the beginning of the month or just after your most recent round of bill checks is cashed. You may have more money in your account, but that doesn’t mean the money is available for creditors. We all know that money in a bank account is always fluctuating based on what you’ve just paid and what you have to pay next. Since you are filing for bankruptcy, chances are that all the money in your bank account is already intended for other purposes. Some of the money in your checking or savings account may be exempt, depending on its source. Your bankruptcy lawyer will counsel you on what exemptions are possible in your case and how much those exemptions are worth. When you file for bankruptcy, you will be required to list the amount in your accounts, and you can then list the source of some of the money in those accounts. You will submit another form that outlines exempt property, including cash in your bank accounts. You may lose some of that money to your bank if you have a credit card or loan with the same bank since it may have rights to a “set-off” if you default. The automatic stay from the bankruptcy filing won’t apply, so you can still be subject to a set-off if you do not pay the bank what you owe. Talk to your bankruptcy lawyer about the legal options available to protect yourself. If you are thinking of filing for bankruptcy, it is important that you work closely with a bankruptcy lawyer. You can file yourself, but you run the risk of making costly mistakes that can have you paying more than you should in your settlement or that can land you in legal hot water. 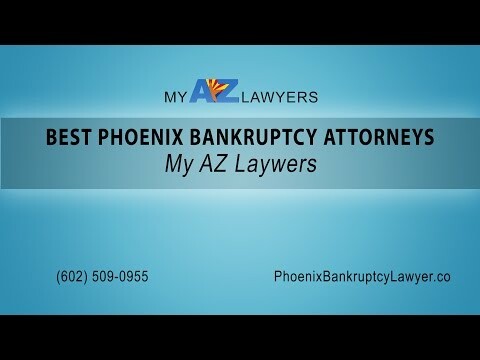 My AZ Lawyers can help you get the debt relief you need by filing for bankruptcy. Our attorneys will counsel you on the appropriate bankruptcy chapter for your circumstances and will help you file for all the right exemptions so that you can keep important assets like your home and your car. Contact us in Arizona today to talk with a bankruptcy lawyer about what’s right for you.